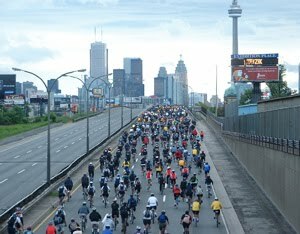 The Ride for Heart in Toronto is one of the biggest rides anywhere in Canada... thousands and thousands of people come out to support Heart and Stroke Disease Research. It's also the ride that really got me doing distance riding in the first place... it never occurred to me to bike 50km before I came to Toronto and heard about this ride! I did that distance a few times, then eventually 75km. ... but then my kids got to the age where they can do it with me, so I'm back with a different goal - pass the love of cycling on to them! I use a trail-behind bike that attaches to my bike and we go out and hammer the 50km Ride for Heart. It's a big accomplishment for them, and fills this daddy with pride and excitement to see. This year I'll be riding with my oldest daughter, Meghan, who is now 8 years old. We'll do the 50km again, which we first did back when she was in kindergarten! Can't wait.